Daily contact between care homes for the elderly and relatives of residents is a delicate relationship. Particularly in the first weeks of residence, it requires a great effort by both parties to ensure that the adaptation is satisfactory, and that the residents are receiving the care and attention they need. David Sadurní, CEO of Smart Technologies Development, is well aware of this. His father, who has Alzheimer’s disease, lives in a specialized centre in Castelldefels (Barcelona). 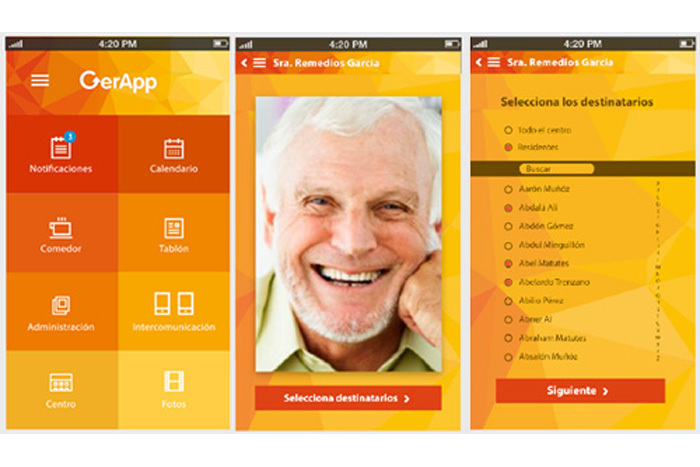 The need to find a vehicle to channel important information for families, including the schedule of activities, nutrition-related aspects or a simple photograph to check how the resident looks, led to the creation of GerApp, an application for keeping care homes in touch with relatives of residents through the mobile phone. To carry out the project, Smart Technologies Development approached inLab FIB, which is a member of the UPC Technology Center (CIT UPC). The work was carried out over five months by a five-person team, led by Marta Cuatrecasas, the coordinator of the Project Development department at inLab FIB UPC. â€œThey had a clear idea and asked us to undertake the technological development of the application, with the requirement that it could function on three platforms (iOs, Android and Windows)â€. To achieve this, inLab used Phone Gap, a framework that enables apps to be implemented on the main supports. For inLab FIB UPC, the work involved putting all their efforts into a project that was focused 100% on marketing the product, â€œwhich was very stimulatingâ€, explained Marta Cuatrecasas. This is one of the technological developments that inLab FIB UPC has launched in collaboration with companies, and particularly with start-ups. This model of collaboration is gaining importance and is of great benefit to both parties. For David Sadurní, the experience of working with a university centre was satisfactory: â€œWe came with the idea and sought the technological support of inLab FIB, who we’d collaborated with on another project, and the result was as expected. They were highly committed, and treated us well. They work on a range of projects, but were still always available for GerAppâ€. It is hoped that the collaboration will continue, currently with the design of a manager for the application, which will also be designed in the technology centre’s laboratories. The heads of Smart Technologies Development are now introducing the application in the first care homes for the elderly, and are looking for sponsors to fund its use, which should be at zero cost for the families and the homes. Meanwhile, the Associació Catalana de Recursos Assistencials (ACRA) has given an award to the idea, as the best innovation in dependency and the promotion of personal autonomy. This entry was posted in Sin categoría and tagged ACRA, App, Cellphone, geriatric, inLab FIB UPC, Innovation, Mobile, Smart Technologies Development, start-up on 10 September, 2015 by www-citupc.